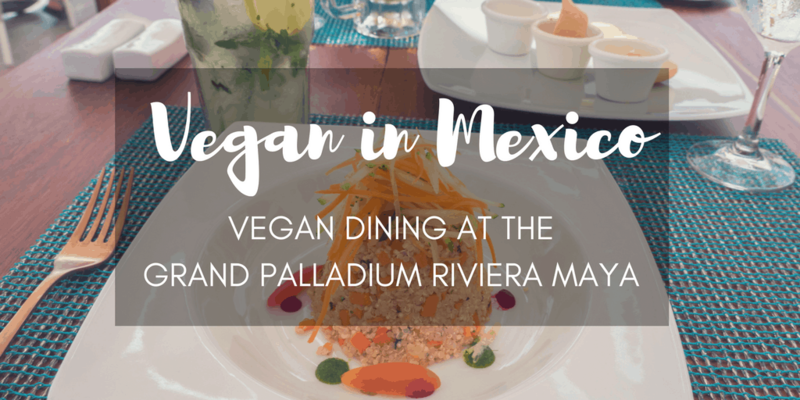 Wonder if you can dine as a vegan at a resort in Mexico? 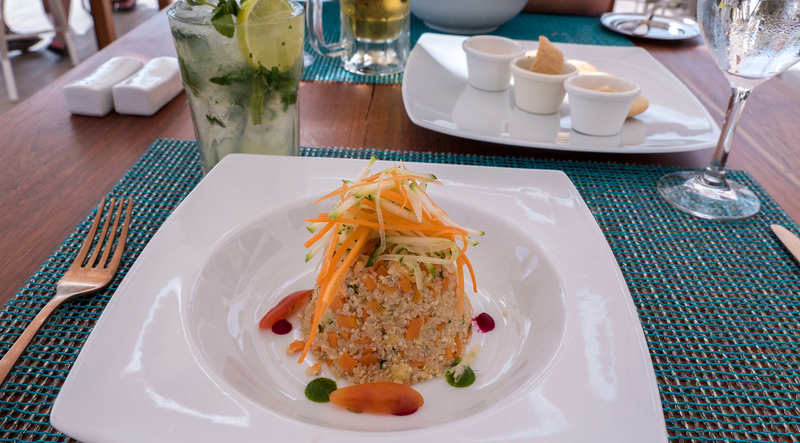 Have you had any success dining as a vegan at a resort, and where? Yes, it’s possible! 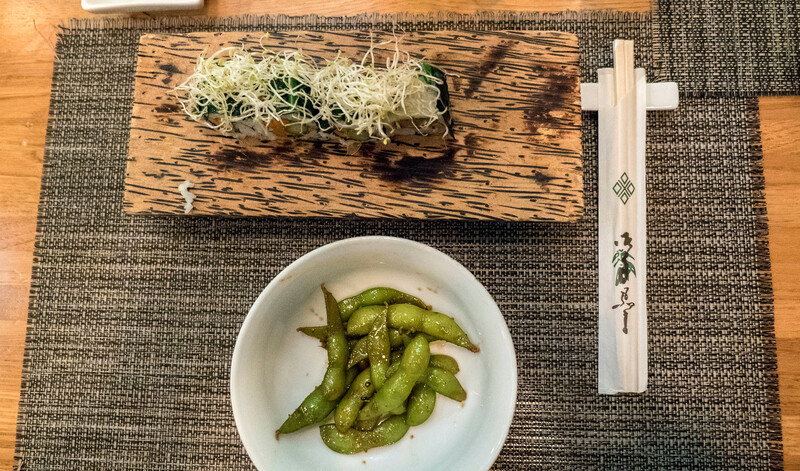 It’s more than just possible, it’s a treat for your taste buds. 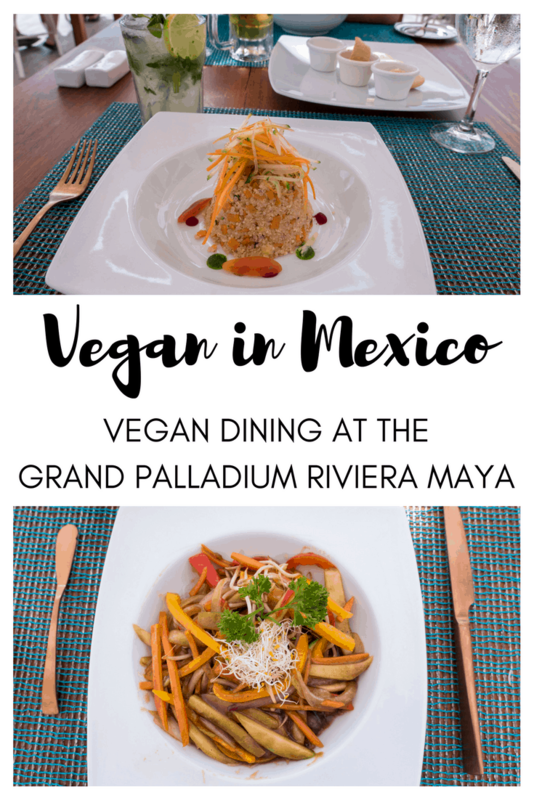 As a travelling vegan in Mexico, I had no problems finding delicious plant-based eats at the Grand Palladium Riviera Maya Resort & Spa. While there was not an entirely vegetarian or vegan restaurant on site, every restaurant was able to prepare a vegan meal. Most of these were off the menu and by special request. When you arrive at the resort, it’s important to inform the front desk that you are following a vegan diet. A staff member will bring appropriate allergy cards for you. For instance, there are allergy cards for Celiac, seafood, dairy, egg, nut, and others. Even though I am not allergic to dairy or eggs, I carried the allergy cards for those. That way, it became easier to tell the staff that I was vegetarian, but also could not have dairy or eggs. Typically when I approached the host and server at the restaurants each night, I simply told them I was vegan. Sometimes I had to provide some clarification as to whether I consumed seafood, dairy or eggs as part of my diet. It was never a problem to order a vegan meal. Some items on the menu were naturally vegan, and some were specially created just for me. 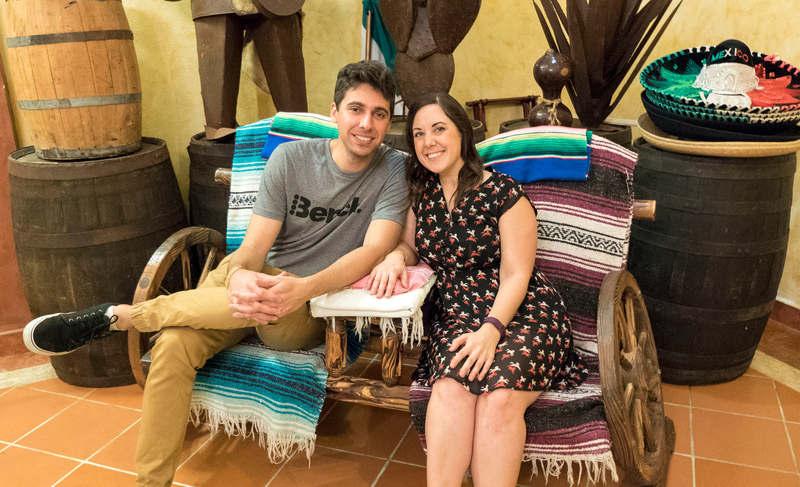 Justin and I stayed at the Grand Palladium White Sand Resort & Spa for part of our stay, and at The Royal Suites Yucatan Hotel for the other half. 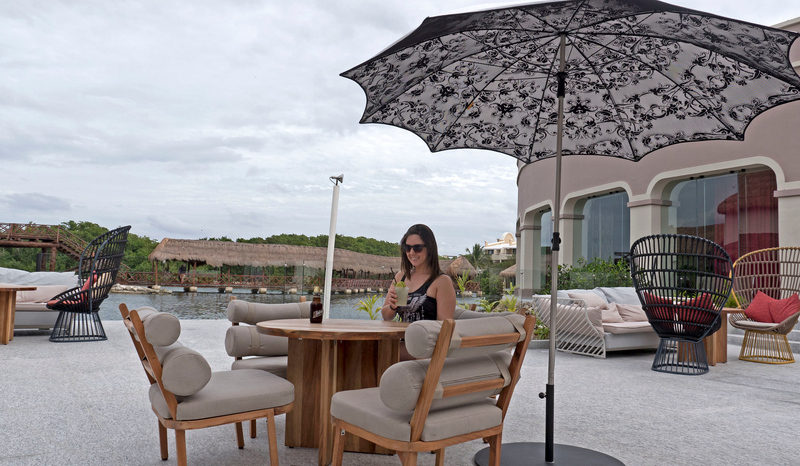 As these are both part of the Grand Palladium Riviera Maya (there are four resorts within the complex), we had access to all of the restaurants. We tried different ones each night and still barely scraped the surface of what was offered! 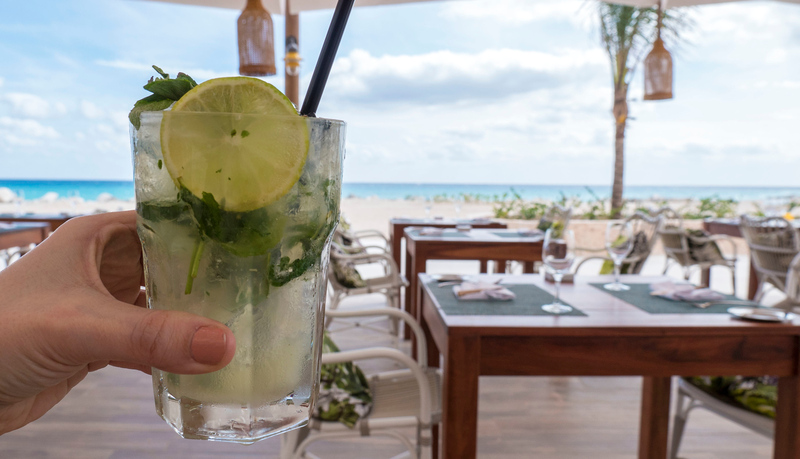 In total, there are 4 a la carte restaurants at TRS Yucatan, 9 a la carte restaurants throughout the other Grand Palladium resorts, 5 buffet style restaurants around the complex, and 22 bars in total. Wow! 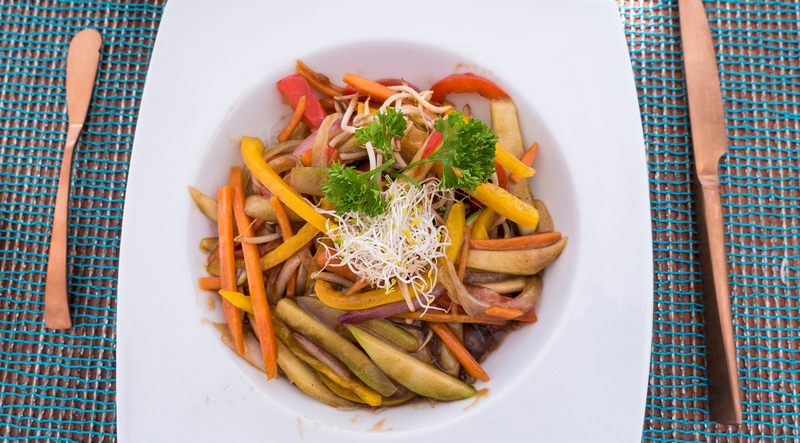 There are several international cuisines featured with something for every taste. We also attended the Chic Cabaret dinner theatre production one evening, which included a five course meal and beverages. Needless to say, finding food was never a problem. Want to see exactly what I ate? Here’s how I maintained a plant-based diet as a vegan in Mexico and succeeded in eating delicious and healthy meals. I’ll let you know which items were on the menu and altered, and which meals were created by the chef with my dietary restrictions in mind. Portofino is the Mediterranean style restaurant at Grand Palladium. 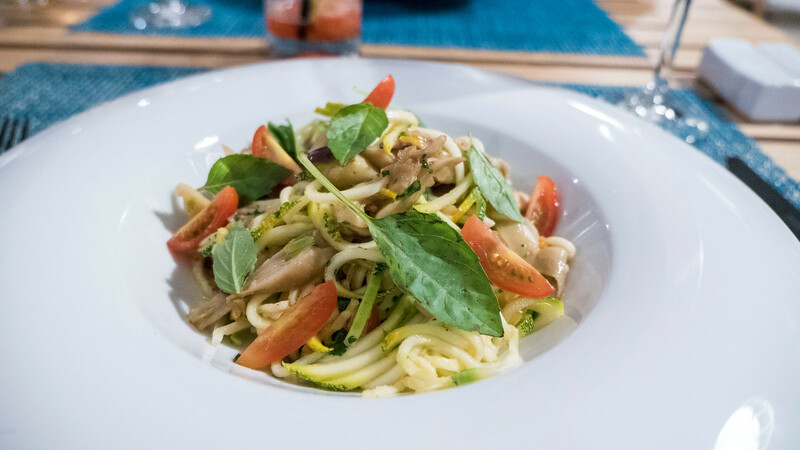 They serve mostly pasta, pizza, and other dishes with flavours from the Mediterranean. 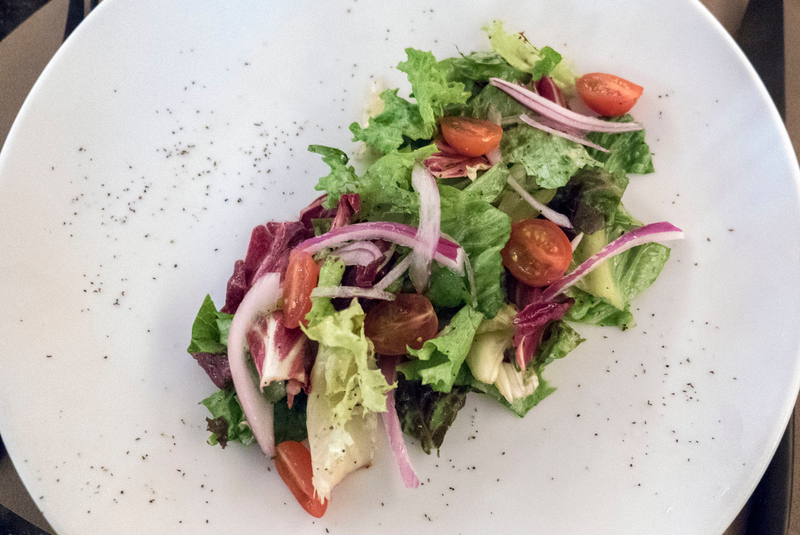 Naturally, it was easy to dine as a vegan in Italy, so it was easy to veganize meals on this menu, too. 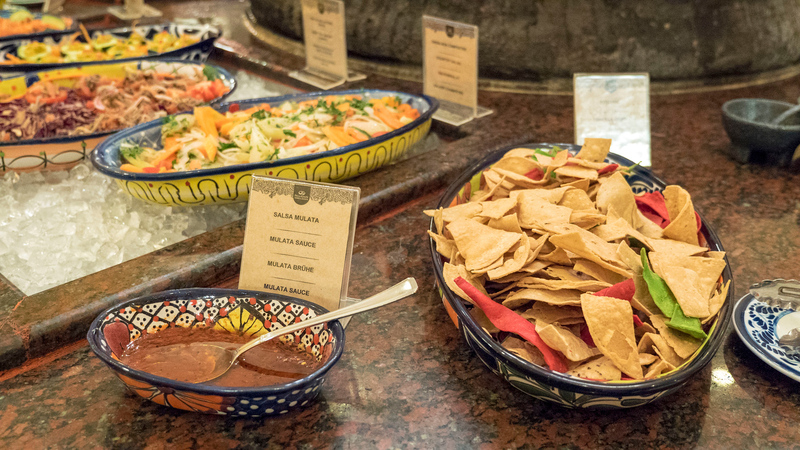 Every guest can order dishes from the main menu and help themselves to the restaurant’s buffet. 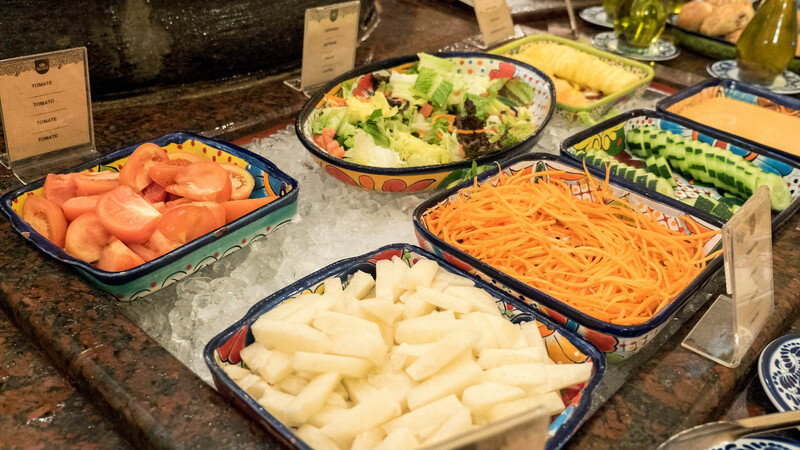 From the buffet, the vegan offerings include pasta salad, roasted eggplant, grilled vegetables, and minestrone soup. 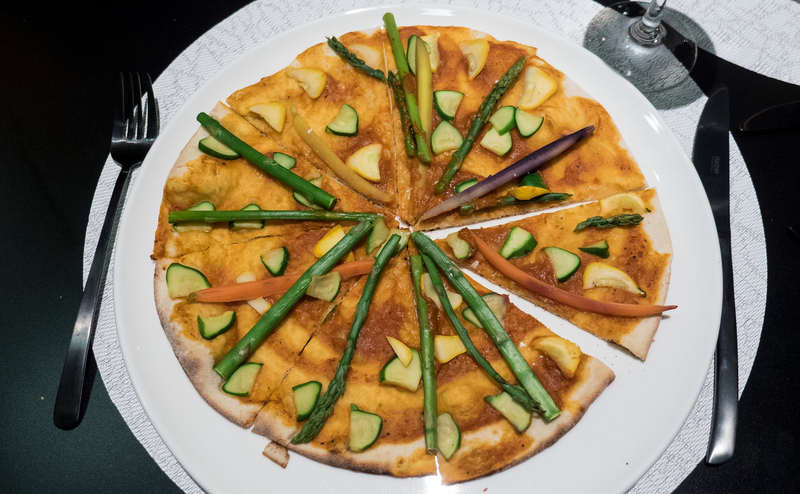 As none of the regular main dishes were vegan (there were two vegetarian pasta dishes and two vegetarian pizzas on the menu), the chef offered to prepare a vegan meal for me. 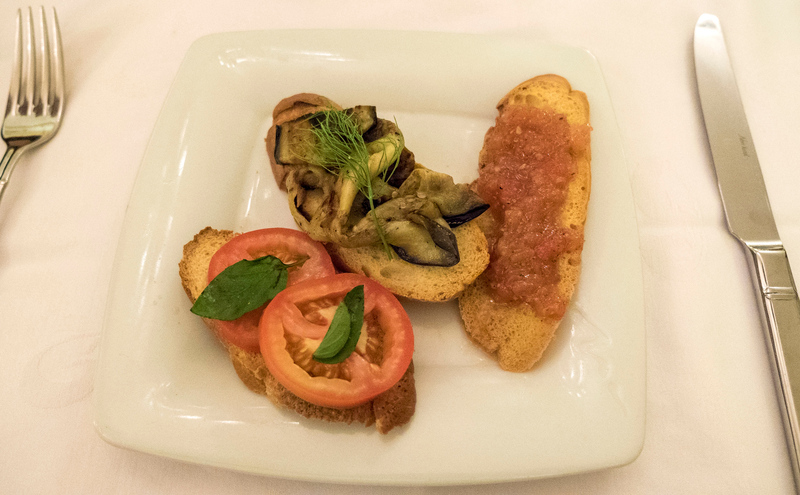 To start, I ate a trio of bruschetta toasts (two different tomato ones, and one mushroom). 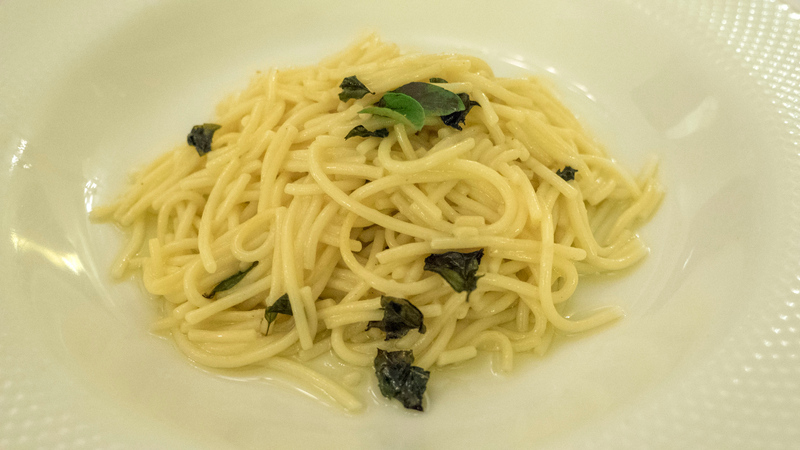 My main course was pasta in oil, garlic, and basil. Everything was really yummy. After my dinner here, I was confident that the rest of my vegan meals at the resort would be excellent. Sumptuori is the Japanese restaurant at the Grand Palladium Riviera Maya. It features a teppanyaki, although we didn’t partake in watching fish and meat being cooked before our eyes as we weren’t eating any of it. Thankfully, Sumptuori has regular dining tables, too. Surprisingly, there were a number of vegan starters on the menu. There weren’t any main dishes, so the chef prepared a stir fry noodle meal with tofu and vegetables that was very satisfying. As for the starters, I ordered edamame, vegetable sushi rolls, and a tofu salad (mix of fresh greens, fried tofu, and a soy garlic vinaigrette). 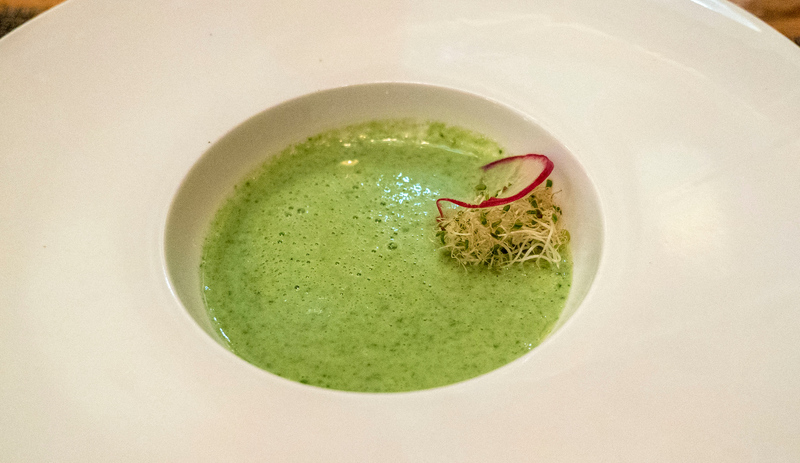 The chef also insisted that I order the edamame soup, which was naturally vegan – vegetable and edamame broth with coconut milk and soy milk. I wasn’t initially sold on the idea of a chilled edamame soup, but it was actually quite good. I arrived to Sumptuori not sure that I’d be able to order anything on the menu, and left having ate five different vegan dishes. Not bad, eh? 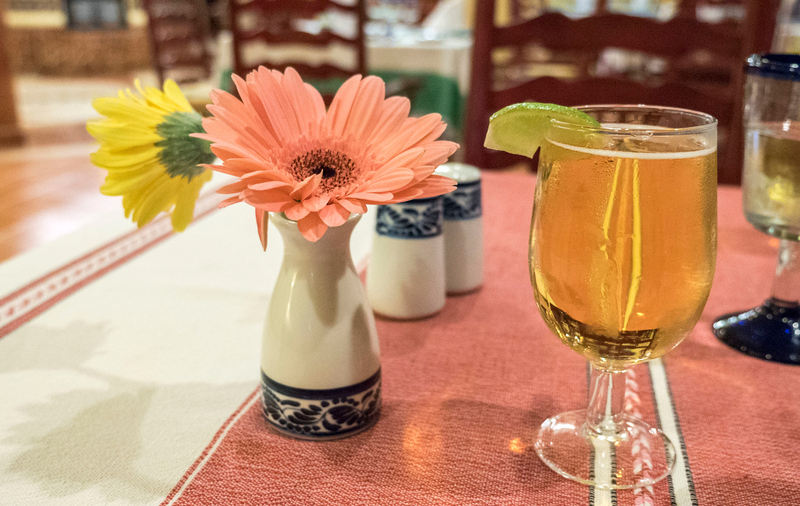 It’s only fitting that you dine at a Mexican restaurant in Mexico. 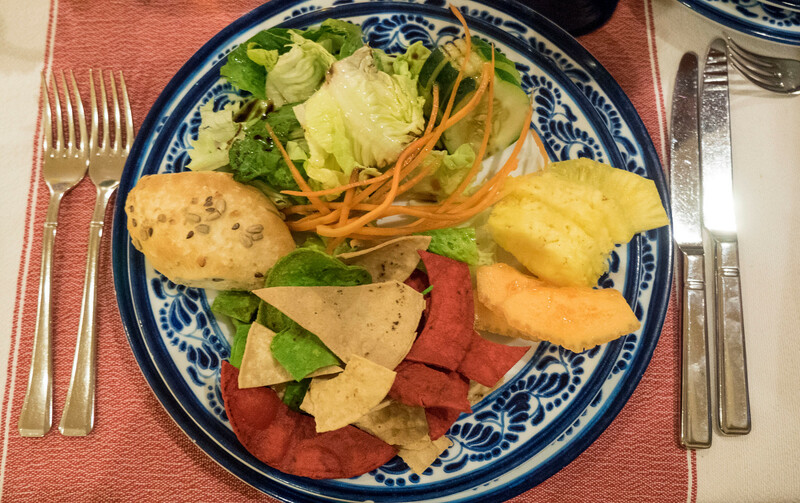 Finding vegan food in Mexico isn’t that difficult, so there are naturally some vegan options here. Much like Portofino, there is a buffet at this restaurant to start, and then you can order an entree. 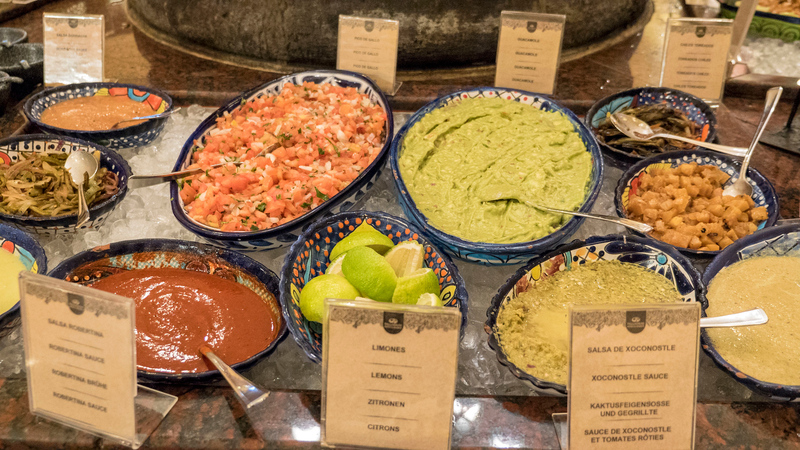 At the buffet, we helped ourselves to nachos, salsa, guacamole, fresh fruit, and salad. On the main menu, there is a section marked as “vegan dishes.” However, the meals are vegetarian and not vegan. As the chef informed me that the tortilla wrap contained dairy, he created a deconstructed burrito as my dish with rice, grilled vegetables, and sauces. I recommend visiting La Adelita if you’re dining as a vegan. 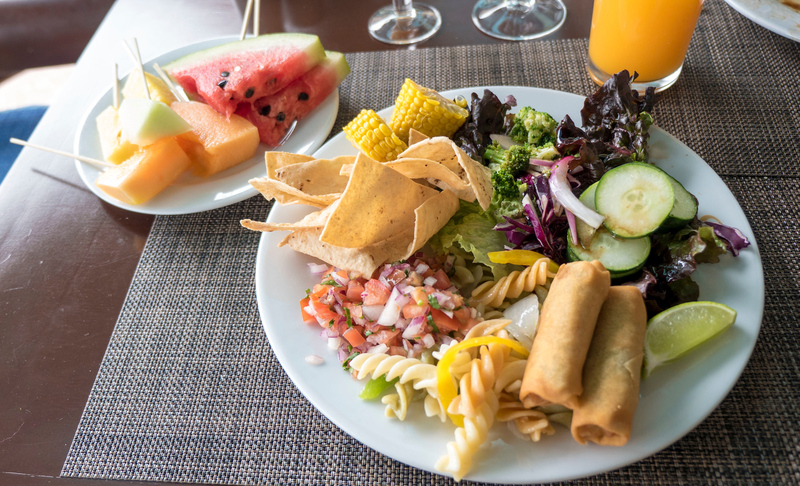 There are lots of yummy plant-based meals to find at the buffet and coming out of the kitchen. 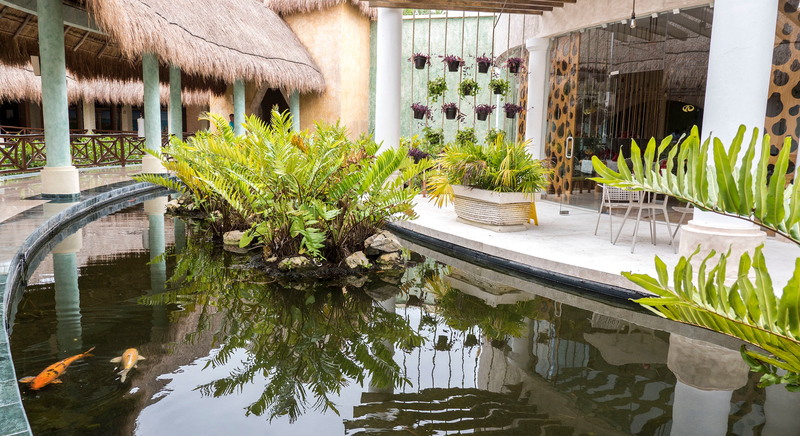 Once we moved over to The Royal Suites Yucatan, we dined at their specialty restaurants. 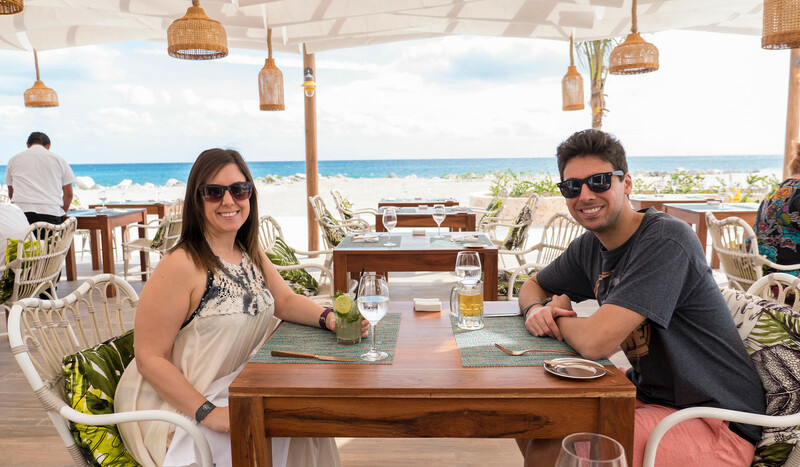 The Helios Beach Club restaurant is open for both lunch and dinner. For both meals, it was very easy to order vegan offerings. For lunch, I ordered a quinoa salad, minus the feta cheese. 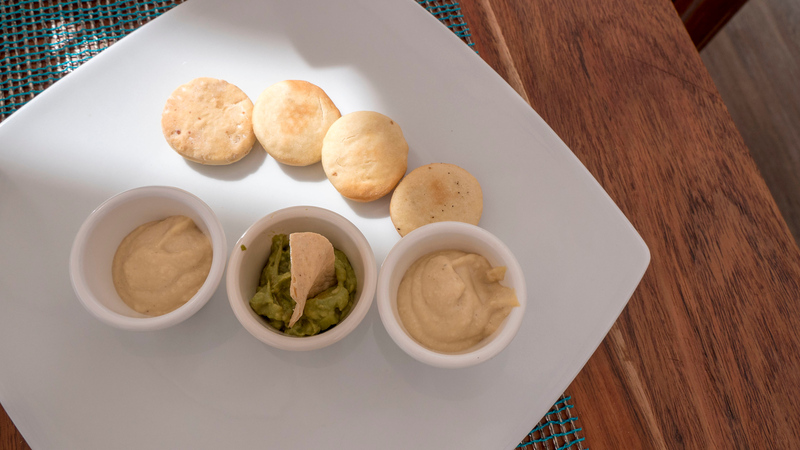 There was also a dip trio (hummus, guacamole, and spinach dip) where I opted out of the spinach dip and they brought two servings of hummus instead. 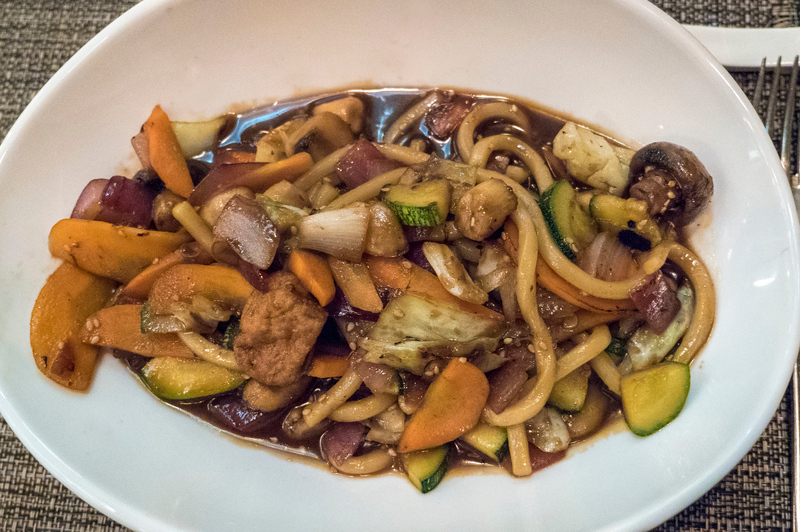 For my main, the chef created the “chicken wok with noodles and vegetables” without the chicken. I loved dining outside right by the sea. There was a gorgeous view with peaceful ocean sounds. 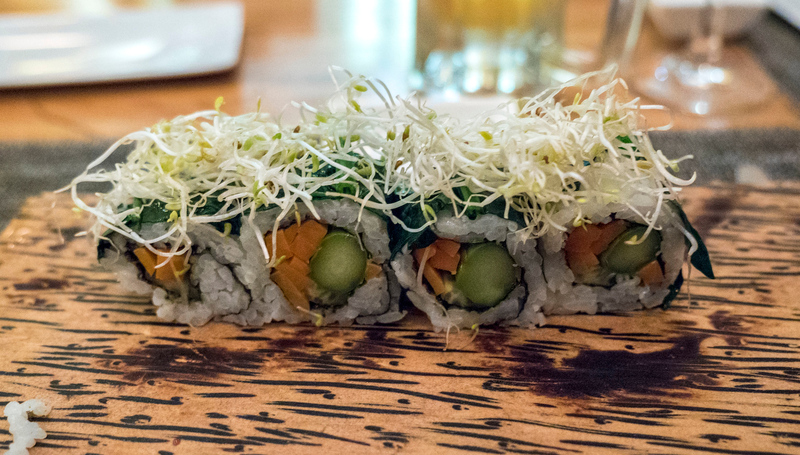 For dinner, there weren’t too many vegan offerings besides a couple of side dishes. The chef of this restaurant knew exactly what to make for a vegan, and I was very pleased with my dinner. Please excuse one the quality of this first photo – I had to use the flash because the power went out across the resort for a few minutes! It was actually pretty exciting to dine in the dark. After I ate my green salad with avocado, the lights came back on in time for the main course. 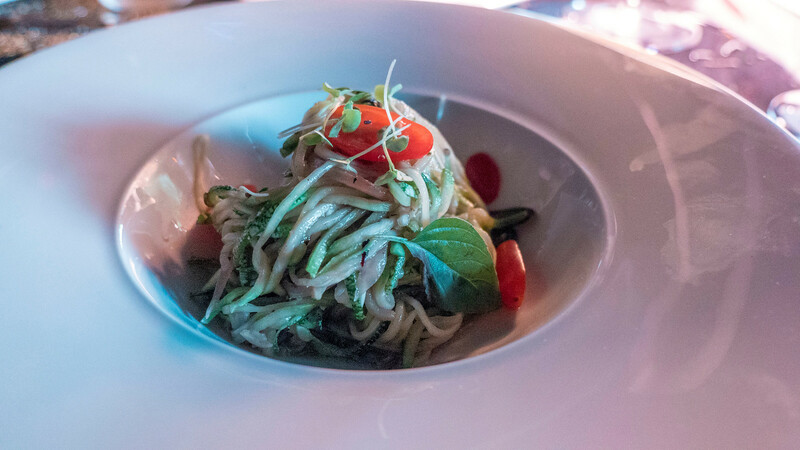 My entree was a raw zucchini noodle dish with vegetables and fresh basil. The star of this meal was the dessert. I hadn’t really had much dessert since arriving at the resort. 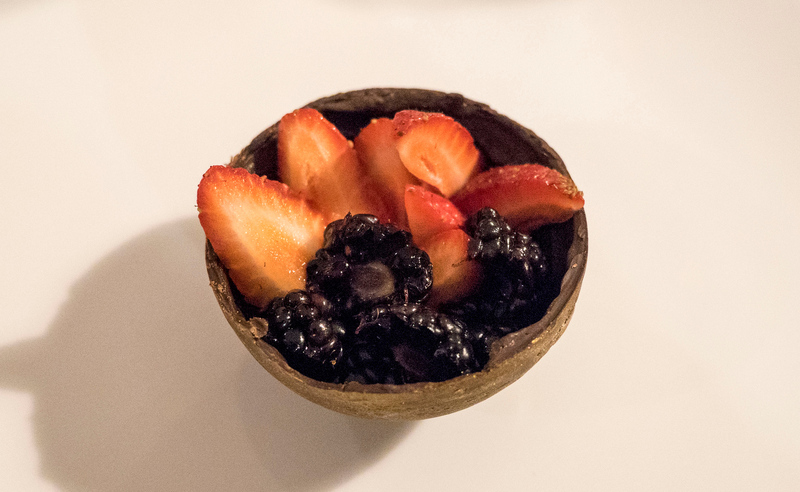 However, the chef created a dark chocolate cup dusted in gold with fresh berries inside the chocolate bowl. Oh my goodness – it was so yummy! 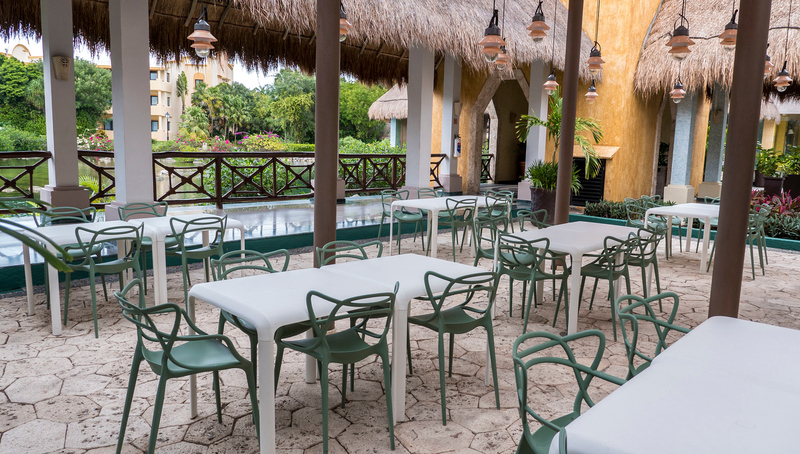 Tentazione is the Italian restaurant at The Royal Suites Yucatan. 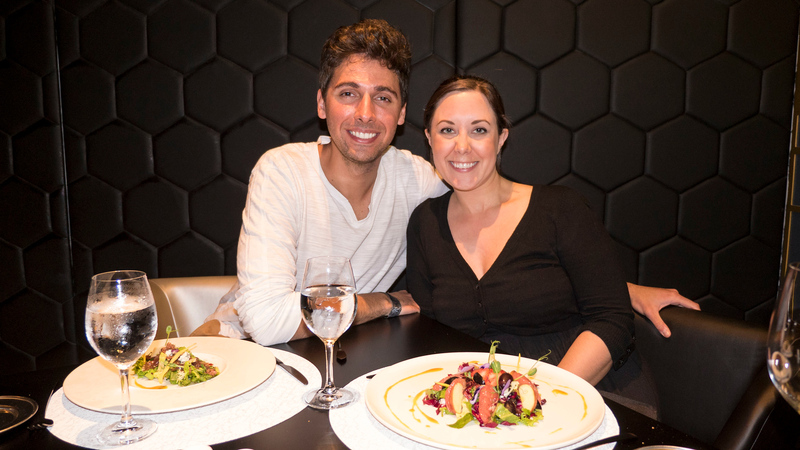 Decked out in dark walls with gold trim, Tentazione is an upscale establishment offering several courses. 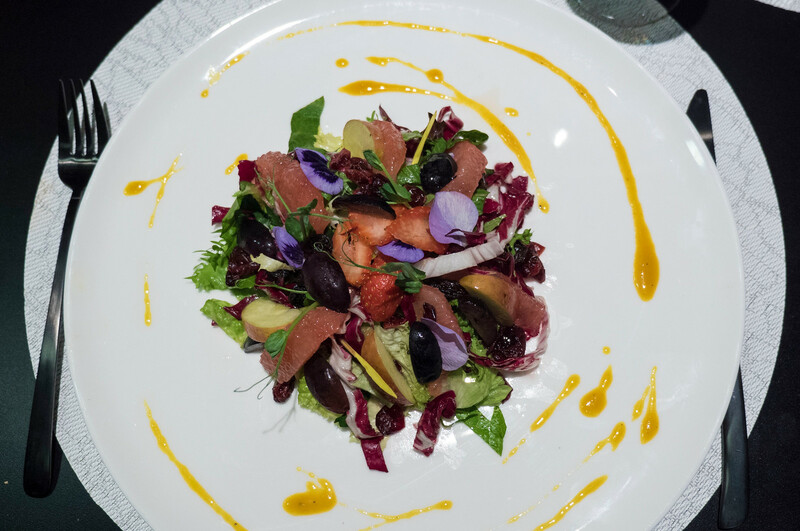 As for vegan meals, the chef went off the menu and created a beautiful salad as my starter topped with edible flowers. For my main, I requested a veggie pizza without cheese as I hadn’t had pizza all week and was craving it. 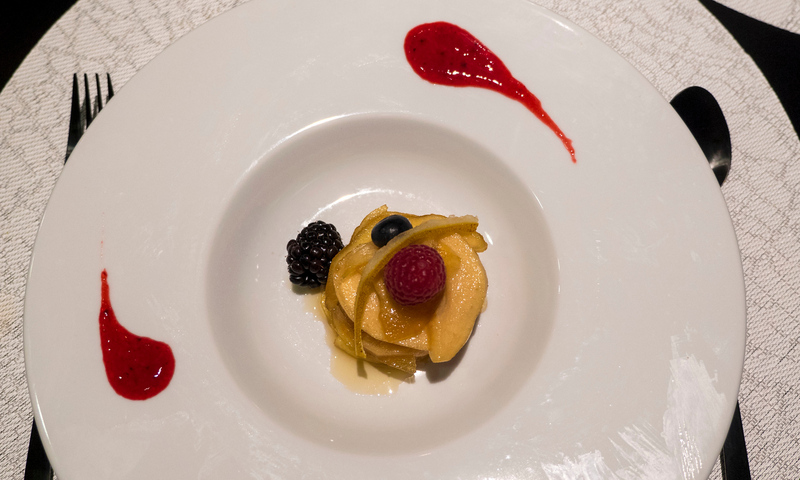 For dessert, the chef prepared fruits soaked in syrup that was quite decadent. We had dinner booked at the Brazilian steakhouse, and I wasn’t sure what to expect in terms of vegan food. It wasn’t any surprise there weren’t any vegan or vegetarian choices on the menu. 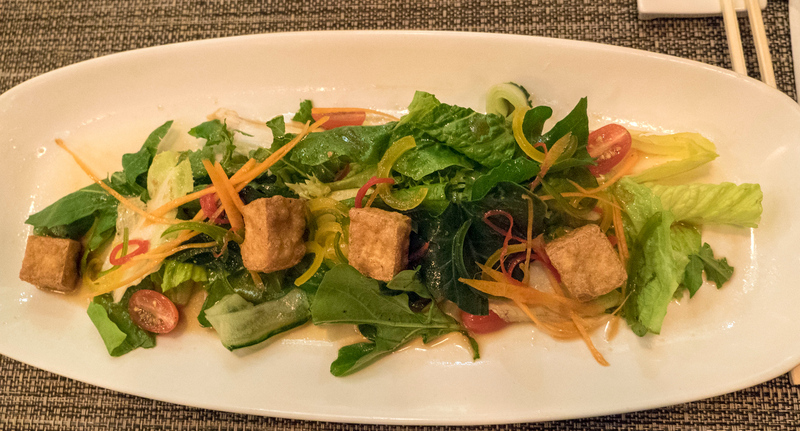 At first, the chef came to the table and promised to make a tofu stir fry with chimichurri sauce. That sounded awesome. 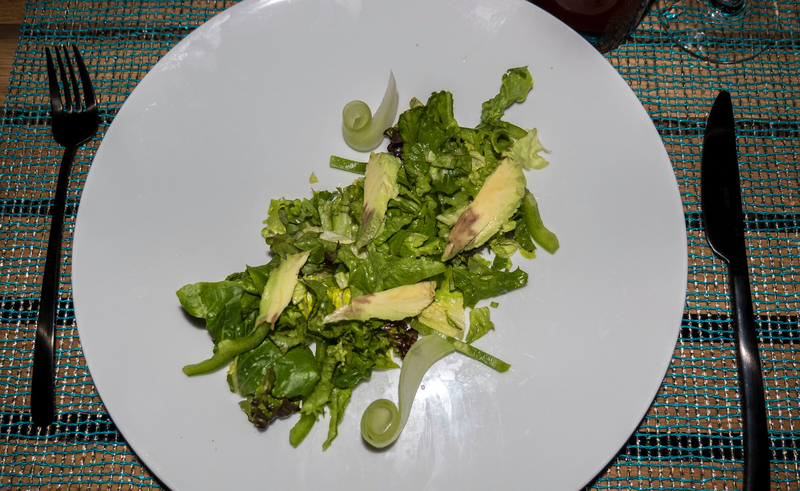 To start, a green salad arrived that wasn’t anything out of the ordinary. Next, when my main dish arrived, it wasn’t the chimichurri dish. It was a regular pasta dish with tomato sauce and a side of vegetables. Unfortunately, it wasn’t anything spectacular, but it was edible and vegan. I think that I’d have been more pleased if I wasn’t expecting the original tofu chimichurri meal! 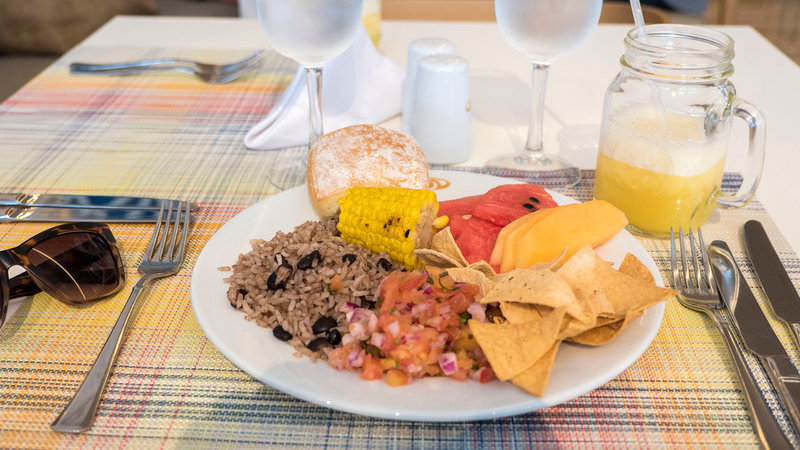 We dined at the several buffets across the Grand Palladium Riviera Maya for breakfast and lunch. 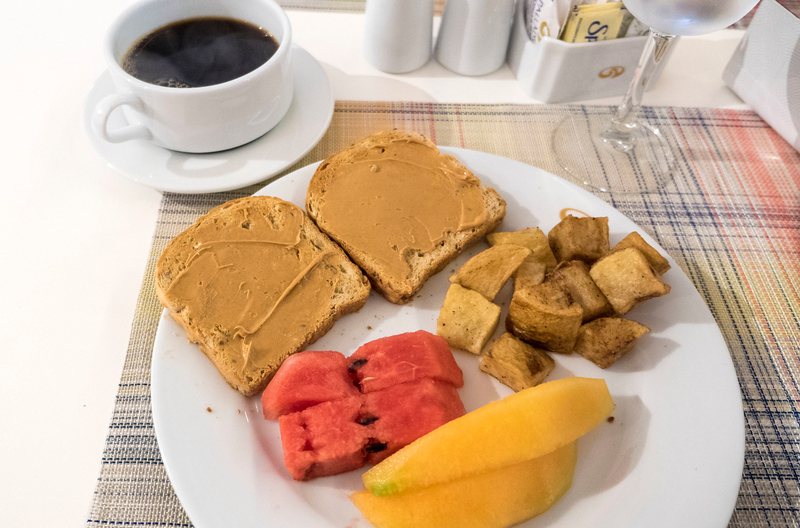 For breakfast, I typically had toast with peanut butter, fried potatoes, and fresh fruit. For lunch, I had a combination of salad, fruit, vegetable spring rolls, beans and rice, corn on the cob, pasta, and tortilla chips with salsa. 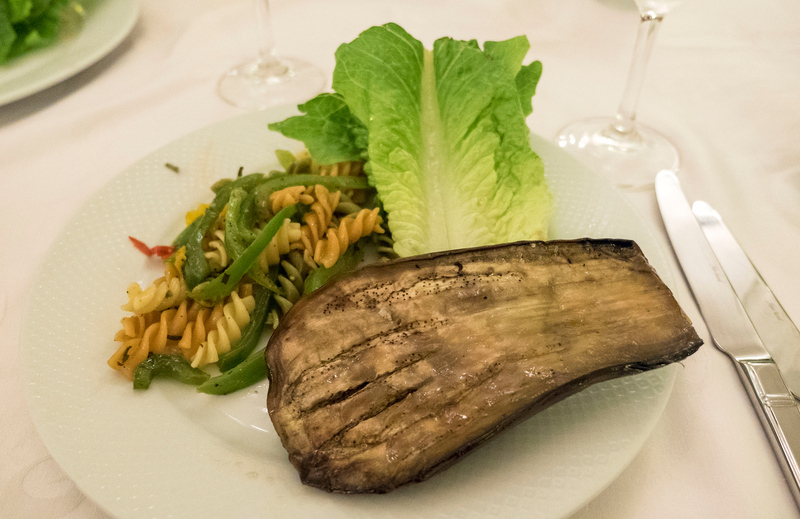 There were always lots of options at the buffet, and it was fairly obvious which items were vegan. If in doubt, be sure to ask the servers or the chef. 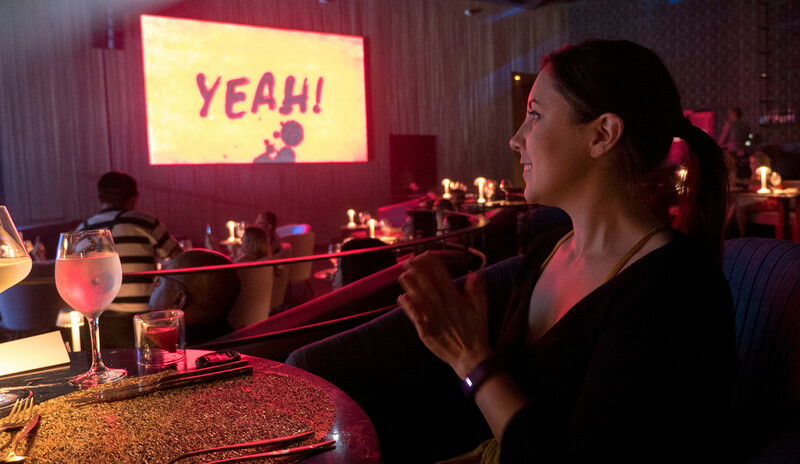 At TRS Yucatan (and available to all guests), there’s a dinner theatre show called Chic Cabaret. 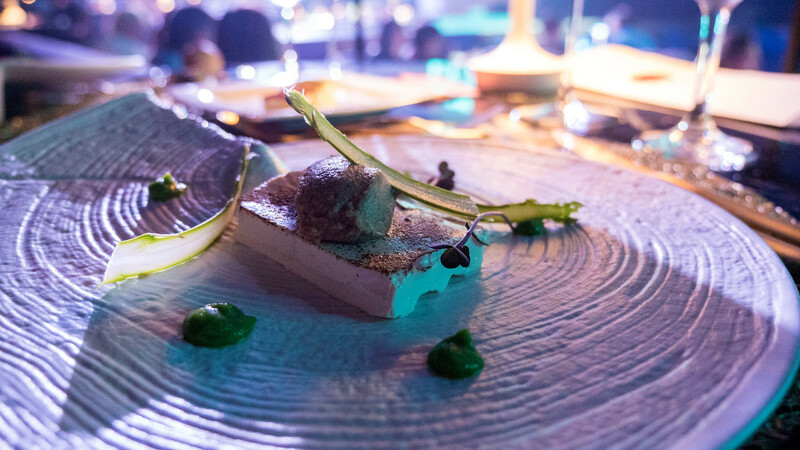 It’s an extravagant evening where you’re served several meal courses while watching an impressive stage show. Chic Cabaret has talented performers who sing, dance, and even perform acrobatics. 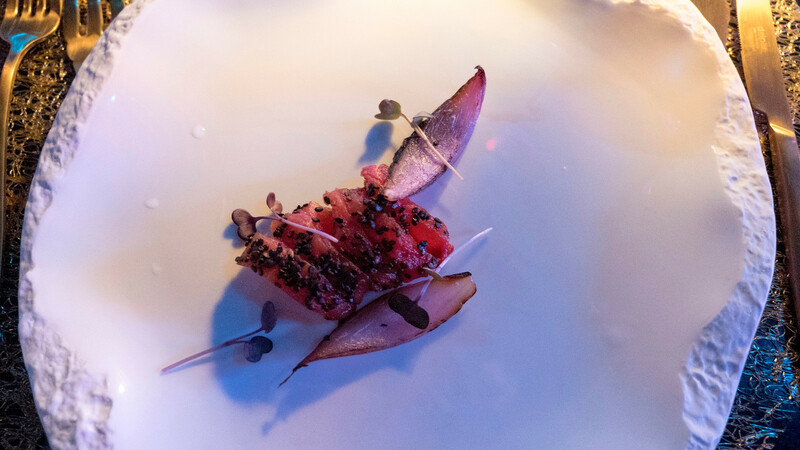 It was a feast for the senses: our eyes, our ears, and our taste buds. It’s easy to have a vegan meal, too. To start, I enjoyed a unique sushi dish made out of fruit. Next, there was a flatbread crunchy bite with a savoury filling. Third, I received tofu topped with roasted garlic. 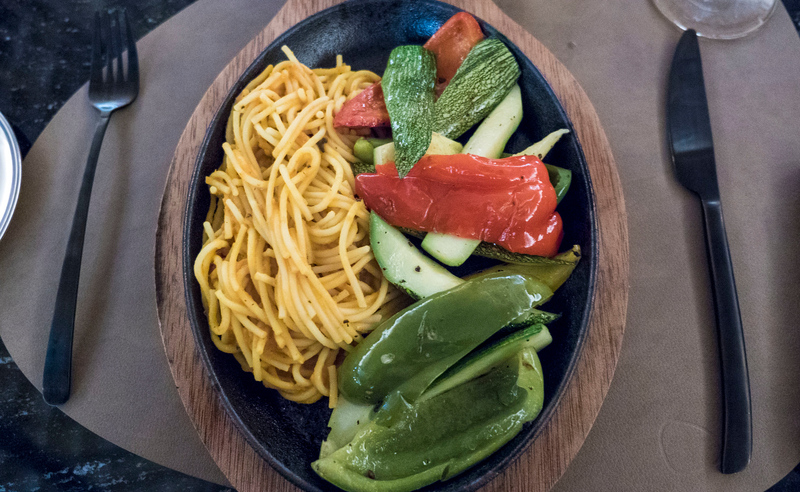 My main course was reminiscent of the one I ate at Helios for dinner – zucchini noodles with vegetables. 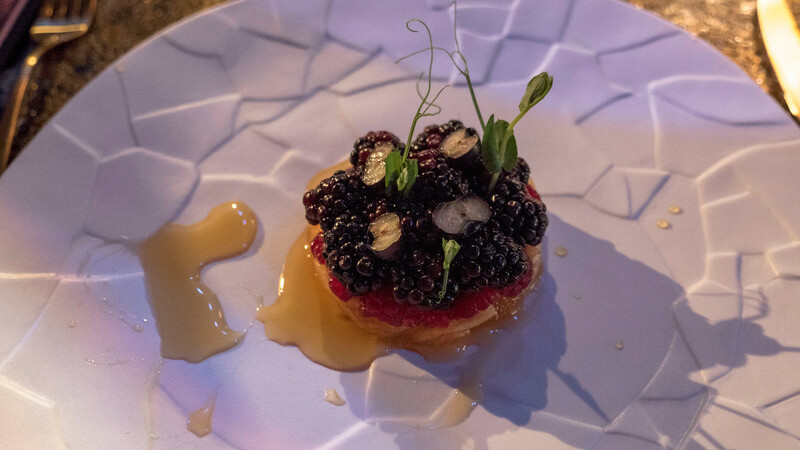 And for dessert, there was sweet fruits soaked in syrup and topped with berries. 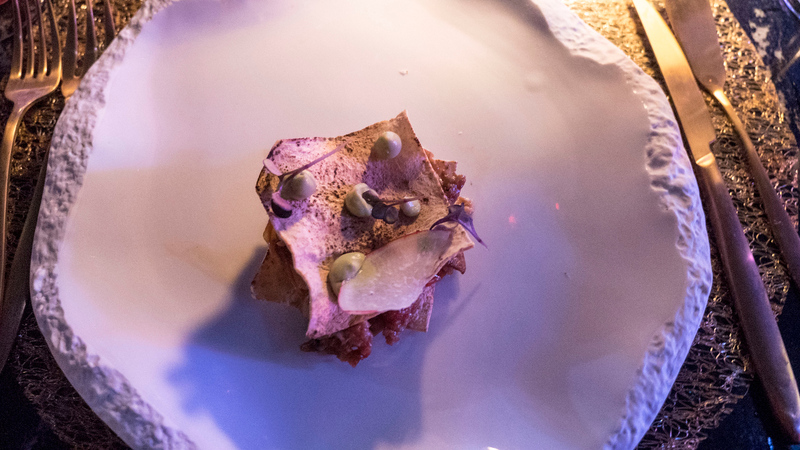 These courses arrived throughout the performance, so it’s best to make the resort aware that you follow a vegan diet when you book your tickets to the show. That way, the chef has enough warning to prepare vegan food for you. There’s no need to worry about finding plant-based meals in Mexico. 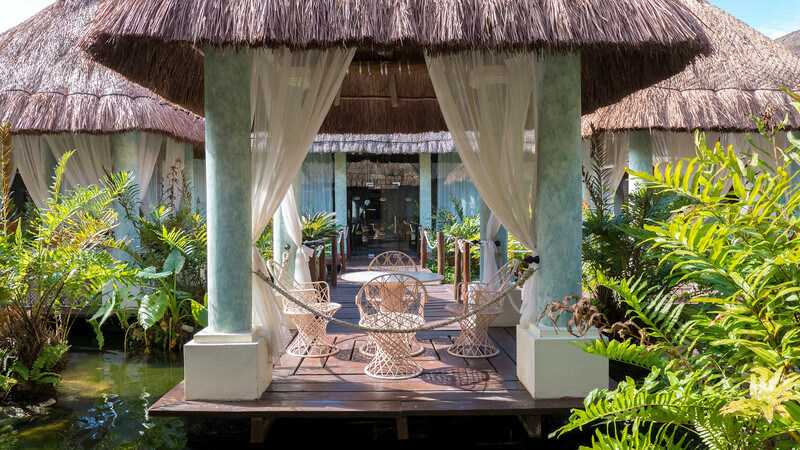 When you travel to the Mayan Riviera, be sure to stay at a resort like the Grand Palladium Riviera Maya Resort & Spa for a stress-free, relaxing holiday. 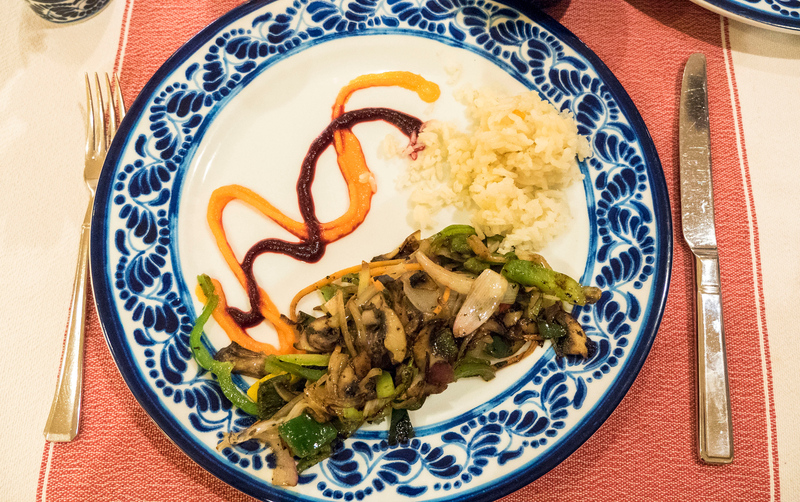 They make travelling as a vegan in Mexico very easy with healthy, delicious, and fresh tasting dishes. To view more photos from the Grand Palladium in Riviera Maya, please check out my travel photo album. You can purchase prints, housewares, and so much more of every photo on our site. Check out the photo album and click “buy” on any photograph for more details. Thank you so much to tripcentral.ca and Grand Palladium Riviera Maya for hosting our stay. Our opinions, as always, are entirely our own. We just got back from the Grand Palladium. My dad and brother are both vegetarians and loved the selection! We really loved the Japanese restaurant! I’m happy to see that there are Vegan bread options! Can’t wait to go! Thank you so much for this blog post! My wife and I have been going to palladium resorts for 9 years now. We switched to plant based diet after last flu season, and were super worried about our upcoming trip. Bailey has been scouring the internet looking for options, and now we have all the info we need for another great trip! Oh excellent! Yes, you have nothing to be worried about. You might have to make a couple of special requests here and there, but the staff were super helpful to ensure everything was plant based for us! Yummy food, too. Enjoy your trip!